I shared this on my instagram stories last week, so I hope you saw it there, but if you didn’t— here ya go! I think the term “meal prep” has become a) over-used and b) kind of intimidating. For lots of people, the chore of spending a bunch of time, cooking a bunch of food, packing a bunch of containers and washing a bunch of dishes is anything but exciting. And instead of looking for an alternative that works better, many of us are just throwing in the towel on meal prep altogether. If you want to actually see me prepping (ingredients, how-tos, demos, etc.) —> head over to my instagram where I post it in my stories & save it to my “Mealz” highlight as well. to mix ‘n match for some variety at mealtimes. 2) there’s not much to make ahead of time for this meal. This week’s PROTEIN sources are: chicken nuggets + deli turkey/ham. —> from this, I’ll have some chicken nuggets for my evening meal & some sandwich-type wraps for my afternoon meal. For my VEGGIES this week, I’m having greens, sprouts, tomatoes + cucumbers on my wraps and some microwavable broccoli steamer bags + spaghetti squash mac ‘n cheese with the nuggets. For my CARB SOURCES this week, I have the wraps for my lunch & I bought pre-cooked, frozen sweet potato fries to go with my nugget meal. It makes it so easy to “prep” when I think this way! Two meats, couple veggies, couple carbs. It also takes a lot of the “prep” out when you buy frozen stuff! Also- you can totally use stuff you probably already have, like rice or pasta from the pantry! This is an old meal-prep but these are the nuggets I’m making this week + 2 “sides” that were both frozen & microwavable! The only things I really had to “prep” this week were my homemade chicken nuggets (see insta stories/highlight for this recipe!) & the spaghetti squash. The rest, I’ll put together at each meal. If I knew my schedule was going to be crazy this week, I would have pre-made the mac ‘n cheese, & fries and maybe portioned out a couple of meals to grab ‘n go. 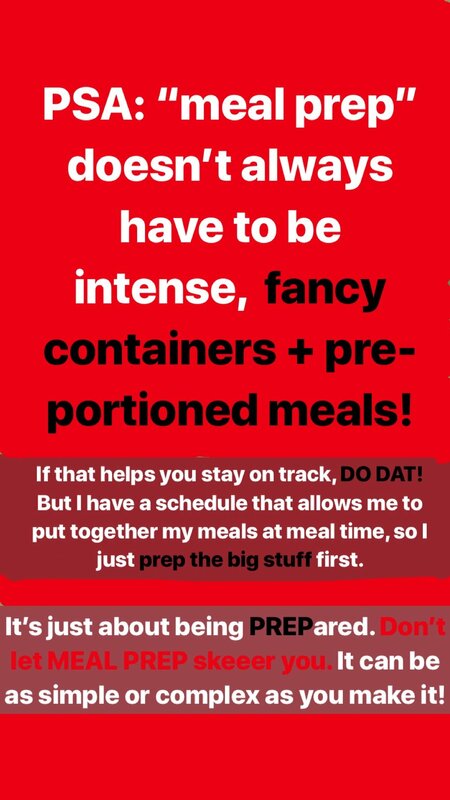 But meal prep can be as complex or simple as you want/need it to be! The main thing is that you are prepared: prepared for mealtimes so that you aren’t scrambling for something healthy & thus likely ending up eating something not-so-healthy. then spend an hour shopping + an hour cooking on Sunday. Meal prep questions, fears or requests? Shoot me an email, comment below or DM me on instagram! I’m always happy to help & learn from you guys, too!